My friend was nice enough to take me to the airport for my flight to San Francisco. Since my flight was around 1pm she picked me up from my house around 10am to get Taiwanese breakfast. I never really had Taiwanese breakfast before I just know they serve sweet soy milk (甜豆漿) and rice rolls stuffed with pork floss or dried shredded pork. My friend S pulled up to Doe Jon Station, doe jon is soy milk so this is soy milk station. S, S’s sister D and I walked into Doe Joe Station sat down and looked at the menu. Well they knew exactly what they wanted and so I left the ordering to them. I did look at the menu and I did order one thing and that’s the shredded turnips with ground pork bun. One by one our food came. First were the two big bowls of sweet soy milk. I didn’t know it was going to be a big bowl, I just wanted a taste I’m not even a fan of sweet soy milk!!!! After that a bowl of noodles came. It’s a bowl with cellophane noodles, mushroom, and pork meat in a thick broth. We also got a plate of pot stickers! Pot stickers for breakfast!! I like that idea. Then another plate came and it was the rice roll with pork floss inside then finally my turnip pork bun came. 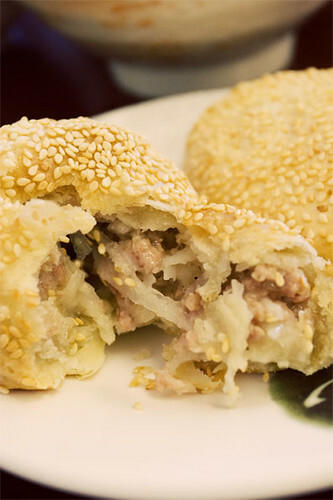 Hhhhmmmm flaky pastry bun nice and warm with turnips and pork inside. It had a good balance of turnips and pork. Everything was soooooooo good, especially the potstickers. They were nicely brown and crispy on one side and soft on the other side. I prefer these longer kind of potstickers I don’t know why I just do. The bowl of noodles was great also, though it was a bit hot to eat a bowl of hot noodles. Again I don’t know why but I really like this style of thick soup. I might have to make some at home. 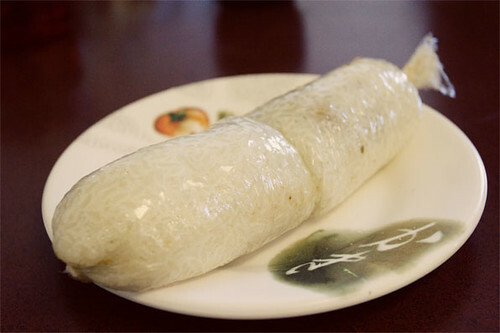 The rice roll with pork floss was simple and good. This must look weird to some people. 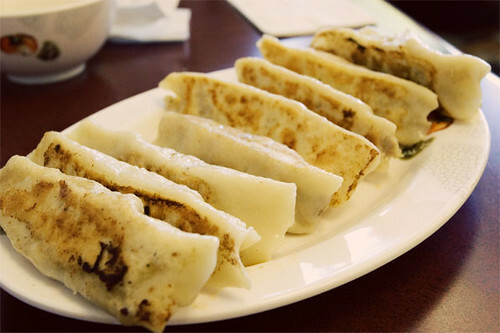 Potstickers for breakfast?!?! I’m Chinese and it felt weird to me also. But it’s kind of like going to Denny’s and have breakfast all day. Hot soupy noodles and potstickers all day and night! When I arrived at SF, I found out that most pizzerias in SF don’t open before 4pm. WTF?!? !